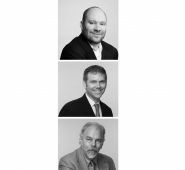 Holabird & Root is pleased to announce the promotion of three of our most accomplished Project Architects: Greg Grunloh, AIA, Brett Gawronski, RA, and Tom Lassin, RA, have been promoted to Senior Project Architects. Greg Grunloh,AIA, has been with Holabird & Root since 1995 and he is the director of Holabird & Root’s Professional Development committee, created to mentor and assist younger architects in the firm to become licensed. His long client record includes such highlights as the University of Chicago, Illinois Institute of Technology, and Cornell College. He is currently working on the Richard E. Workman Sports and Wellness Complex in Effingham, Illinois. Greg is an Associate of the firm. Brett Gawronski, RA, also an Associate, joined Holabird & Root 9 years ago and has been an asset to the company in serving several Chicago-based and municipal clients such as the Chicago Housing Authority, Pullman Wheelworks for Mercy Housing, and Waubonsee Community College. Brett holds a Bachelor and a Master of Architecture from the State University of New York at Buffalo. Tom Lassin, RA, joined Holabird & Root in 2005, and he is an expert in renovation projects. Tom has served such projects as the renovation of the J&J Arnaco Monroe Building, the Marquette Building renovation and restoration, and several various renovations projects for the Chicago Housing Authority. Tom lends his over 40 years of expertise to the many varied and complex projects the firm undertakes and he is relied upon in the office as a learned and knowledgeable member.